Use pre-installed social media applications; Facebook and Twitter to connect with your friends. In addition the advanced AV browser can play streaming videos. * Compatible with new SiriusXM SXV300. Enjoy Album Art, SportsFlash™, Traffic & Weather Now™. When an iDataLink Maestro Rr is connected to a compatible KENWOOD receiver, it provides a seamless interface with factory infotainment features such as Satellite Radio, USB Media Player, Bluetooth handsfree and music streaming. The unit then displays the onboard features of the vehicle information. Your smartphone display can be transmitted to your KENWOOD receiver wirelessly by connecting the optional KCA-WL100 Wireless display adapter. Connect your smartphone via HDMI/MHL to mirror its display on your receiver. 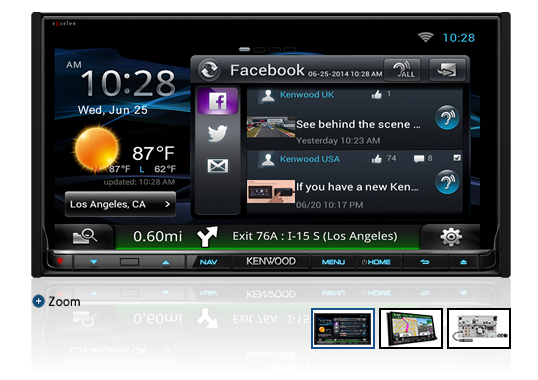 Operate your smartphone applications with the receiver touch panel.